These user-friendly tools will keep you and your class inspired, inventive, and organized. Eye in the Sky: Melissa Browning’s students saw their school’s Brooklyn neighborhood through Google Maps’s street view. Many of us have used Google Maps to find driving directions, but its usefulness goes way beyond getting from point A to point B. Before a field trip, your students can study the area they will visit through a variety of maps, including street, terrain, and satellite views. Then document your trip by creating personalized maps that include your route, as well as fact balloons, photos, and even videos. Google Docs is particularly handy for teachers when revising students’ work. It allows you and your class to track what changes have been made, save each revision, and collaborate in real time. And it’s a great organizing tool: You can easily upload old documents in other applications to Google Docs so all your files are accessible in one place. Not only can your students create electronic documents and spreadsheets, they can also instantly access and edit each other’s essays, post their work to a blog, publish it as a Web page, and create eye-catching presentations — all within the same program. Blogger allows you to create your own blog that contains important information about your class, assignments, and upcoming tests. It requires no HTML, and you can easily update and edit it from anywhere. Your students can create their own blogs to display writing and photos and to share information with each other. And you can set all blogs to “private” so only those users you approve may access them. Google Book Search, the electronic equivalent of browsing through a library, is a great way to find new books for your class to read or for your students to use as research tools. You can browse through specific categories, type in keywords, or search for particular titles. Each result includes the information you’d find about that book in a card catalog, plus a table of contents, links to book reviews and related works, and other resources. For instance, in the results for Mark Twain’s The Adventures of Tom Sawyer, you’ll find links to scholarly works about the novel. For copyrighted books, the results may provide a few sample pages, but for books in the public domain, you may be able to read the entire work online. If you want to keep track of your searches, you can create an online library of books by clicking “Add to my library” for any book you’d like to include. You can review, rate, and do a full-text search on the books in your library, and you can share the link with others. Google Book Search also lets you buy any book online or search for it at the nearest library. That’s only a sampling of the features Google for Educators offers. So, try out a feature that’s new to you or use a familiar tool in a new way to see how Google can make your lessons more effective and more convenient. Sara Ring is a contributing writer for Edutopia. She lives in Los Angeles. This article was updated in July 2011, by former Edutopia staff writer Sara Bernard. Google Plus The latest social network to appear on the scene has great features built in that educators will definitely enjoy — this article from Mind/Shift outlines the various ways teachers have started using the Hangouts tool. Google Apps Education Edition Tools for the whole school, including Google Talk (instant messaging, phone, or video chat) and Google Sites (a way to create a simple Web site for your class; “edit it like you would edit a document”). Google Teacher Academy A free, one-day professional development program for K-12 teachers that helps them get the most out of tech tools. Participants become Google Certified Teachers at the end of the day. Google Groups A great way to create your own safe and private online community, for collaborating and communicating with your colleagues, your professional learning network, or your students. Picasa A free photo editing software that makes searching for, editing, and sharing pictures online easy. Google SketchUp An easy-to-use program that allows teachers and students to create three-dimensional designs and models. Check out teachers using SketchUp in the classroom in theEdutopia video about Build SF Institute’s School-to-Career Program. Google Sky Either download the sky feature for Google Earth 4.3 or use it straight from your browser at sky.google.com. Students can learn about constellations, planets, the “life of a star,” and more. Google for Educators Discussion Group Designed to keep teachers abreast of new features on Google for Educators, but also a place for teachers to connect and share resources. Edit: This article is getting a lot of attention so I’ve decided that some more background info on 3D printing is in order since I only briefly describe the technology. For more info see these TED Talks on 3D printing: 7 TED Talks on the wonder of 3D printing. 3D printing went from underground nerd-toy to “the next big thing” in just a couple of days when Obama mentioned it in his State of the Union address on Tuesday. The day after the SOTU stocks having anything remotely to do with 3D printing made a significant jump, ranging from 2-6%. A couple of days later, the web is a-buzz with 3D printing; seems that everyone wants to voice their opinion about what it is, why it matters, and what we are going to do about. I shall gladly partake in the frenzy as this has been a fascination of mine for some time (although I still don’t have a 3D printer, which kind of bums me out). But, before I start, let me just say to educators – If you haven’t already, you better start thinking about getting a 3D printer in your school and figuring out how to use it! Essentially, 3D printing involves taking a computer generated model of an object, feeding it to a computer and having the object physically constructed by layering a material (usually some sort of plastic although some metals are used too) in the shape of the prototype model. The result is a physical replica of the computer generated model that you can pick up, use to perform some function or as a component in a larger, more complex object or machine. 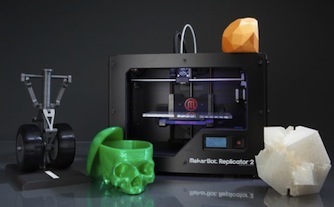 3D printing has been around since the late 1990s. However, for much of that time the required equipment has been very expensive (up to 6 figure prices in US$), slow and limited to the construction of small objects. 3D printers were initially marketed for use as prototypers for objects that would be manufactured using other methods and materials. Thus, the process was often referred to as “rapid prototyping”, i.e. it was used to construct examples of designed objects to look for flaws in the design of the object before it was mass produced. It’s debatable how “rapid” the process was; it could take many hours or even days to print a very small object depending on its complexity. Nevertheless, this was considered more efficient than having to send out the model to have it constructed elsewhere using far more expensive processes and materials. The first time I saw a 3D printer at work was in the early 2000s. It took several hours to produce a ~2 inch tall bust of Aristotle, and it wasn’t even a very good replica of the original, at that. But, I was facinated by the possibilities of such a machine. I imagined what the world could be like if everyone could have one of these devices in their home – mind blown! The home 3D printer is becoming a reality. Today, there are 3D printers available for as little as $500. And in a telling development, many of these cheap 3D printers are, in fact, manufactured using 3D printers on a per-order basis, i.e. they’re self-replicating machines! (Sort of… Not all parts are printable and the product does require manual assembly which can be a bit of a hurdle for the layperson.) However, these cheap 3D printers are significantly limited in regards to the size of objects that can be printed. But, the challenge then is to design products that can be constructed out of fairly small pieces that these printers can handle. So, what does all of this mean? I want to talk about three different dimensions of this development; the consumer dimension, the producer dimension, and the educator dimension. First of all, there is the matter of the dematerialization of consumer products. “Dematerialization” (or “ephemeralization” as Buckminster Fuller called it) is used to describe the way that some consumer products are being made to be delivered without the exchange of any physical object. In recent years we have seen this happen with music, video games, movies, books, photos and other products. Instead of having to go and pick up, or have delivered, a physical object when we purchase these products, we now simply download them on the Internet. 3D printing will enable the dematerialization of consumer products on a scale that we can only imagine today. Instead of purchasing physical objects we will simply purchase the computer generated model and fabricate the product ourselves. It is likely, due to the limitations of currently available 3D printers, that the first things that we will purchase in this manner will be user-serviceable replacement components for sophisticated products. For example, we could purchase the 3D model for a car part or a bicycle part, fabricate it on our home 3D printer, and install it ourselves. Secondly, because of what I’ve described before, there are important consequences for producers of consumer goods, and thus for the future of work. As the dematerialization of products continues, producers will be far more design-oriented, and less manufacturing-oriented, than they are today. What’s more, they will have far more things to consider in their design processes than they have until now. Rather than simply thinking about how to design products that work, they will have to take into consideration the capabilities and limitations of at-home fabricators, and the skills needed by consumers to make effective use of their products, i.e. that assembly is straight forward and relatively simple. This adds a whole new dimension to the design process, especially as regards relatively to considerably complex products that use many components. These will have to be designed specifically for do-it-yourself consumers and may therefore include, not only the components and products themselves, but also technological solutions to aid in their assembly and maintenance. Thirdly, the knowledge and skills needs of increasingly design-oriented labor markets will put pressure on educational institutions to change the way they educate future labor market participants. Educational institutions, while still expected to meet expectations in regard to general and civic education, will also be expected to prepare learners for collaborative creative work in a hyper-abundant design-based economy that we have yet to fully understand how will function. Google is usually one of the first places students turn to when tasked with an assignment. Whether it’s for research, real-time results, or just a little digital exploration … it’s important they know how to properly Google. Lucky for teachers (and students, of course), Google has a handy set of lesson plans that are just waiting to be unleashed upon the leaders of tomorrow. While I understand there’s a LOT more to research than just Googling, it’s important to note that this is where nearly all students start their research. Therefore, it’s a critical skill if they’re going to start down the right paths. Below are 15 lesson plans courtesy of Google designed to make students better online researchers. They’re organized by difficulty and meant to help students (and everyone) become better online searchers. Check out the useful Lesson Plan Map too to see how all these lessons fit together and what skills they teach. Worth a look! Last November, Justin Reich, our co-founder at EdTechTeacher, wrote a piece on his Education Week blog, If You Meet an iPad on the Way, Smash It. The piece came out the morning of the first iPad Summit in Boston and put iPad use in schools into perspective. As Justin explained in the piece, “If the nitty-gritty details of iPad use distract us from our larger mission, then we need to smash them. If we get too lost in the “how” of iPads in classrooms, then we need to stop and ask ”why?” Why iPads is a critical question that must be addressed, and the schools that are making the decision to introduce these devices into the classroom are hopefully examining the why before the how. The concept Amber presented resonated with me, because it not only neatly encapsulated where many classrooms go wrong but also how to right the ship. While the how question is critical, and requires a basic understanding of the apps being used in the classroom, the device itself is never as important as what can be done with it, or in many instances what can be done without it. The critical idea to keep in mind is that the focus should be on the action, not the app or device itself. In many ways, the “verbs not nouns” concepts aligns nicely with Justin’s perspective on smashing iPads. But what can teachers and students actually do once iPads are in place, and it is time for students to create, demonstrate, collaborate and publish? There are endless list of apps available online, but only a handful focus on the verbs, on what students can do rather than on the app itself. AtEdTechTeacher, we have created just such a page to help teachers in iPad classrooms keep the verb in mind. Organized by what students can do with iPads, the iPad As…page places the priority on tangible ways that students can create, demonstrate and collaborate. I still thoroughly enjoy the discussions and debates about the why: they are healthy and necessary. However, I increasingly find that I enjoy the how question a bit more these days. At the upcoming iPad Summit in Atlanta, I look forward to learning from educators from around the world to find out their answers to these how questions.